"A delicious soup. Ideal when served with a Mexican feast." Heat oil in a large pot over medium heat. Heat garlic, cilantro and chili paste. Saute onion until tender. 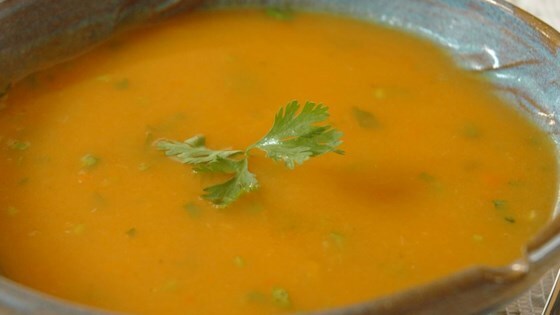 Stir in carrots and potato; cook 5 minutes and then pour in vegetable broth. Simmer for 30 to 45 minutes, or until potatoes and carrots are soft. With a hand blender, blend until smooth. A hearty beef, bean, and vegetable soup that tastes like tacos! Bland as is. Double the amount of chili paste, garlic, and cilantro. Stir in more fresh cilantro, the juice of one lime, and a good amount of kosher salt at the end... delicious! Delicious... Can also substitute crushed red pepper for chile paste. Very good! I used a lot more cilantro than stated, and also a tiny splash of lime juice. The chile paste I used was incredibly hot, so I sloshed in some half-and-half. Thanks, Jennifer! I forgot to add chili at first but the soup tasted so much better with it. Also, it's better the next day.